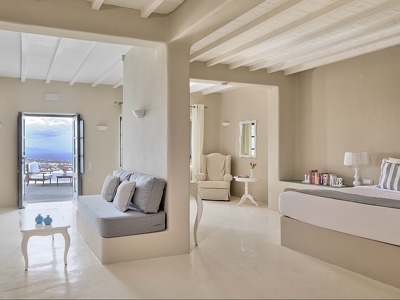 Each of the 10 luxurious suites at Carpe Diem is stunning examples of Hellenic elegance and sophistication. The whitewashed walls and minimalist interiors are filled with bright, natural light. Each suite has its very own private terrace and plunge-pool, and all have gorgeous views over the island’s magical landscape. All of the suites enjoy lavish luxuries including Nespresso machines, complimentary WiFi and pillow menus. The open-plan Alba Suites are elegant and laid-back, and the use of traditional architecture such as thick chimneys and domes provides a great deal of character. Measuring 45 square metres, the suites include queen-sized beds, a living area, and a bathroom with a comfortable bathtub and shower. Each of the Alba Suites feature a 40 square metre private veranda including sun beds and a plunge pool, with stunning sea views. Minimalist yet luxurious, Aura Suites include a queen-sized bed, living area, and bathroom with bathtub and shower. The hotel has a gorgeous private veranda, with an indulgent heated plunge pool giving panoramic views over the island. Spacious and elegant, the Lapis Suite measures over 90 square metres, with an expansive living area, queen-sized bed, a large bathtub, and a walk-in closet. The 30 square meter outdoor veranda includes a private plunge pool and sun loungers. Designed with love-struck honeymooners in mind, the Astra Suite provides privacy and serenity, with a contemporary interior inspired by local architecture. The largest private pool in the resort, the plunge pool on Astra Suite’s private veranda is heated, perfect for midnight skinny-dipping. The Astra Suite features a range of luxurious amenities, including an iPad Pro. Elegantly spacious, the Vita Suite has an air of luxurious indulgence, thanks to the premium champagne bar stocked with a curated list of the finest bubbles in Europe. The Suite features a walk-in closet, a spacious living area, and a king-sized bed. 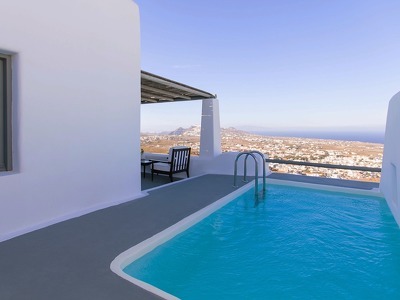 The private sunbathing terrace has stunning panoramic views of Santorini and a private plunge-pool. Decked out in sophisticated minimalism, the Terra Suite has airy living spaces, a small champagne bar, and beautiful views of the sunrise and sunset, which can be enjoyed from your private heated pool. Craft the ideal soundtrack to your Santorini adventure with the iPad Pro connected to wireless Bang & Olufsen speakers. A tribute to the mythological beauties, nymphs and demigods of the Greek legends, the Dea Suite is lavish and indulgent. Treat yourself with complimentary all-natural Apivita cosmetics in the walk-in boudoir, or bask in the sun on your private terrace with pool. Inspired by Santorini’s wine-making heritage, the Lava Suite features an exclusive, temperature-controlled wine bar with a handpicked collection of Santorini’s finest wines, making it a dream for oenophiles. We love the inclusion of a record player and selection of iconic vinyls, perfect for those special romantic evenings. Enjoy stunning views of the island from your private terrace and heated pool. Perched in the historic village of Pyrgos, amidst Santorini’s volcanic crags, Carpe Diem is a charming 10-room hideaway on one of Greece’s most beautiful islands. Carpe Diem’s style is quintessential Hellenic elegance. Blindingly white exteriors give way to calming, peaceful interiors of pale stone, and throughout the hotel discreet, sophisticated furnishings create an atmosphere of chic minimalism. Kick back and unwind below Santorini skies of flawless aquamarine in your private plunge pool, or treat yourself to a pampering massage at Carpe Diem’s spa. After a lazy day spent lounging enjoy a stunning sunset from the bar, before enjoying a romantic meal at the 270º Restaurant, so named for the gorgeous panoramic views it gives over the island. 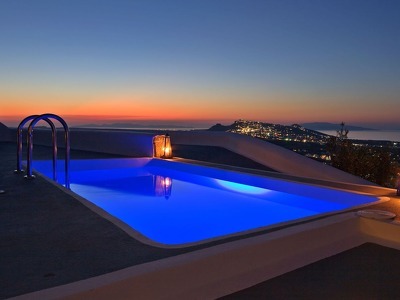 For those with a more active disposition, the hotel is ideally located for exploring everything Santorini has to offer. This Chic Retreat is stylishly sophisticated, yet with a laid-back simplicity that encourages indulgent relaxation. Relax in the sun-kissed privacy of your suite’s personal plunge-pool or, if you fancy more space, head out to the hotel’s expansive infinity pool. The chic poolside terrace gives gorgeous views of the island, with the Aegean sea sparkling on the horizon. Treat yourself to a session at the Althea Spa. Unwind in the beautiful Jacuzzi, or re-energise in the sauna and steam room. The spa offers a range of treatments and massages inspired by the Hellenic landscape, using all-natural Apivita products. 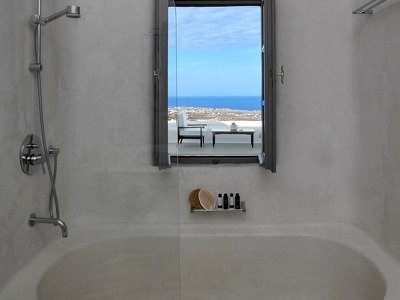 Carpe Diem is located in the picturesque village of Pyrgos, one of Santorini’s most historic villages. Hike to the medieval fortress, where you’ll be rewarded with stunning views of the island, and one of the world’s greatest sunsets. The hotel is perfectly located for further exploration of Santorini; explore the hiking paths that snake across the volcanic hills, or immerse yourself in the island’s ancient history at Akrotiri. Santorini’s famous black-sand beaches are just a short drive away. The hotel’s bar serves excellent bespoke and classic cocktails, perfect for sipping while watching the famous Santorini sunset. The 270º Restaurant serves authentic Greek cuisine, paired with an extensive range of Greek and international wines. The restaurant has stunning panoramic views over the island, making it a deeply romantic spot for a candlelit dinner. My husband and I have just returned from a one week stay at Carpe Diem. We thought the hotel lovely, as were the views. The food was delicious and the staff were all friendly and very helpful, nothing was too much trouble. We both had a lovely relaxing massage in the spa. My husband celebrated his birthday whilst we were there and the hotel presented him with a delicious birthday cake and a bottle of sparkling wine. In spite of the wind in October, we had a wonderful, relaxing time. We went for a massage both heated stones and also a deep tissue one. Amazing spa area and a great destination for couples. Really amazing place to stay . . Only ten rooms so you get more then enough attention by the staff.. as soon as you enter this hotel your put at ease. My partner and I spent a wonderful afternoon at Carpe Diem, away from the hustle and bustle of the rest of Santorini. Called them while in transit between flying in to Santorini airport in the morning and taking a ferry out in the evening. They welcomed us as if we were guests. The service was warm and friendly. We had a wonderful meal, and got superb deep tissue massages at the spa. Went for a lovely two hour walk up to the town of Pyrgos, right above the hotel It reminded me of an older, quieter Santorini of yore.